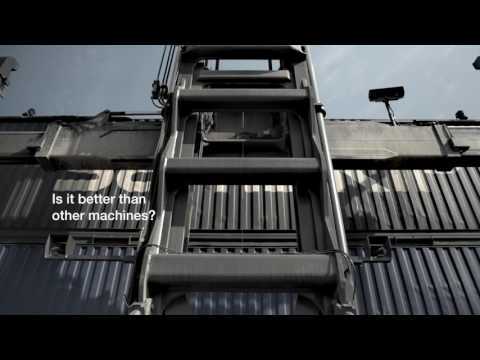 You can expect more from Kalmar’s new range of empty container handlers. Our new range of empty container handlers are based on the experience and accumulated knowledge of building more than 10,000 machines over the last 30 years, so you get the most robust, reliable and efficient machine that we have ever built. You will also have more choice with the broadest range of empty container handlers for you to choose from. Which is why we say - you can expect more. Our new range of empty container handlers can be built to meet your exact needs. You can choose from single or double container handlers with three different lifting capacities, numerous spreader options, a range of extra efficient drivelines and two different performance levels. Your drivers will benefit from our ergonomically designed EGO cabin, which can be mounted in either a low or high position for extra visibility. You can also expect dramatically reduced running costs, easier to access servicing points and longer servicing intervals. To find out more visit our virtual showroom or download the brochure from the link below. Now more safety features and options to customise your machine than ever before. From reverse warning systems to a range of different drive lines and spreaders. Higher productivity with lower fuel consumption means a lower cost per move. Longer servicing intervals with easier access for service and maintenance, saving you time and money. Plus, the highest re-sale values in the market. You can choose from either a single or double stacker models with three different lifting capacities each. There are two different types of cabins that can be mounted in either a high or low position, four spreader options and four different lifting heights to choose from for both the single and the double stackers. Proven, powerful yet efficient drive lines in both medium and high performance versions with 3 or 4 speed manual transmissions and a choice of engines that meet both the EU Stage 3 and 4 as well as EPA Tier 3 and 4 Emissions Standards. With the added efficiency of standard load sensing hydraulics and a choice of options for greater fuel efficiency including Eco Drive Modes, Stop/Start technology and Tyre Pressure Monitoring. New EGO cabin with multifunctional joystick or linear lift levers, advanced ergonomics and improved visibility in all directions, including the corner castings and upwards. Plus, a new tilt cylinder design for greater driver stability and control.